I’ve moved around in the last 40 years of my existence. I’ve lived in several places but there is only one place that I still call home: our family home from back in the 80s and 90s in the south of the Metro. I know it’s cliché but there really is no place like home. I grew up there, my formative years were spent there. That was where I dreamed of the person I wanted to be and slowly grew into the person that I have become today. So many memories were made in that house, both good and bad. I will always love and miss that place. There are so many memories of my childhood home that I will cherish: summers with my cousins. Holidays spent with my father dressing up as Santa Claus. Friends who come over to play and as we grew up, to hang out. Relatives who stayed for vacations, for times when they were in between homes and for times when we all just wanted to be together. Our home had three bedrooms, each with their own color scheme and code names that only people who lived in our house knew. I think as I grew up each of those rooms had become my bedroom at one point and I made it my own, even if I did share it with a sibling. The neighborhood where we lived was pretty safe at the time. We could walk around the area without our parents worrying about us. We could take a bike ride to different parts of the neighborhood on our own. We walked to church. We went to the grocery on our own even as kids. I miss being in that house. To this day, I have dreams of being in that house. It’s like my brain is wired to think of that house as home. When it thinks of home, it doesn’t think of the house I’ve been in now for about a decade, it still thinks of that house with the terrace and the simple garden up front. 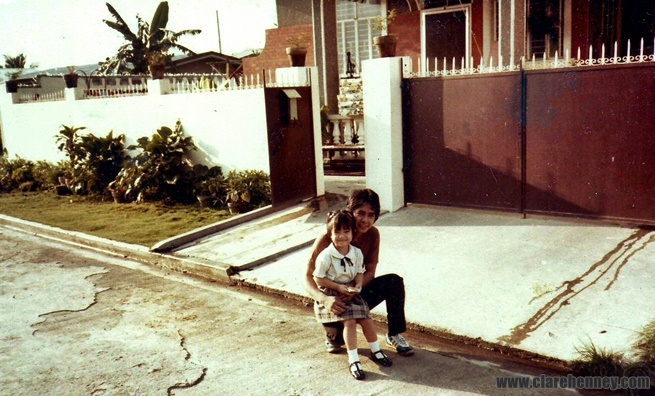 The house with the large garage that often had a kiddie pool during the summers and a sari-sari store with wheels when we felt like making a little money when there was no school. Our family slowly moved out of the house in the late 90s. At first it was just my parents and two of my sisters and then I followed. One of my sisters stayed until she moved as well. We started renting out the house but we were disappointed because the tenants ruined the house after they left. I can still remember going around the house after the tenant left and I was so sad because the house didn’t feel like the home that I grew up in anymore. It looked the same but it felt so different. It was like the childhood home memories I had were not associated with that house but with another one that looked like it. Eventually, we sold the house and bought a new one at the place we are based in now. We finally settled down elsewhere. The sale made everything final and it was sad to think that our life at that home was finally over. A part of me still hoped that we could move back one day, but now that is not going to happen anymore. I remember one time we passed by the neighborhood and we just stopped for a while in front of the house and looked at it. I know people who saw us would probably think that was weird but we couldn’t help it. The whole thing felt sad and bittersweet. It would never be our home again, I know that. But it was just nice to see it again. Looking through my old photos made me realize I hardly had photos of those house in its entirety. I mean, we had photos in the house but you can’t really tell what it looked like based on the photos. I wish we could have taken more photos. I wish we could have kept more to remember the times we had there. I wonder if this house we live in now will ever feel like home. It’s our house, but the feeling I had from our childhood home just isn’t there. I wish I could get that feeling back.